GO GO CURRY offers New Yorkers a place to experience traditional Japanese curry, an ultimate comfort food that’s considered the Mac ‘n’ Cheese of Japan. 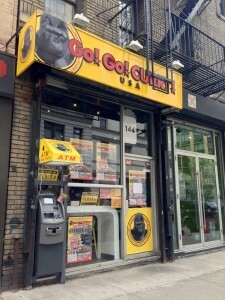 After opening its first New York store near Times Square on May 5, 2007, GO GO CURRY opened a second location near Washington Square Park on March 15 of last year and its third restaurant at the World Trade Center on February 25. Soon you will have one more place to enjoy this special brand of Japanese cuisine: The Chelsea Stadium will open on Thursday, April 25 at 10:55 a.m. The restaurant specializes in “Kanazawa curry” from Ishikawa prefecture in Japan, home of former New York Yankee Hideki Matsui. GO GO CURRY’s founder, Hirokazu Miyamori, is also from Ishikawa prefecture and was so inspired by Matsui’s sensational debut in Major League Baseball in 2003 that he opened his first restaurant in Tokyo. The name originates from Matsui’s jersey number, 55. “GO” in Japanese means the number 5, and “GO GO” is a slang way to say 55. Because of baseball and Matsui, GO GO CURRY calls each restaurant location “Stadium.” The curries also come in baseball-inspired sizes, ranging from “the walk,” to “single,” “double,” and “triple.” The “Grand Slam” options offers hungry customers the chance to try a variety of toppings, and it includes rice, curry, 2 sausages, 1 pork cutlet, 1 chicken cutlet, 1 shrimp, and a hard-boiled egg. The signature dish, and one of the most popular dishes at Go Go Curry, is the pork katsu curry. Katsu is a lean pork cutlet covered in a dense crust of panko breadcrumbs then deep-fried to order. Thick Ishikawa curry marries the cutlet to the sticky rice, while thin sliced cabbage provides a cool interlude that stands up to the dish’s rich flavors. The restaurant’s staple gravy is a rich pork curry delicately spiced and served in a stainless steel bowl. The curry is delicious on its own with no frills, but many customers choose to add toppings from ten available add-ons ranging from tart Japanese pickles to pork katsu. GO GO CURRY has the best katsu curry in Japan, winning the triple crown (Best Curry Sauce, Best Rice and Best Katsu) in a curry competition run by a famous Japanese Magazine Nikkei Trendy. 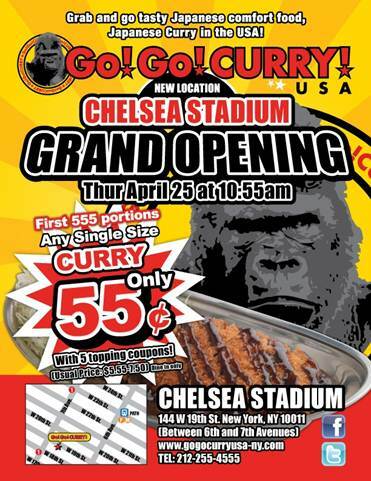 Thursday April 25th: Serving single size (M) Curry for only $.55, limited 555 portions and 5 topping coupons. (Usual price $5.55-7.50) Dine in only. Store Hours: 10:55 a.m. to 9:55 p.m.
Next Next post: Will UNIQLO Take Over the World?